Assemble your ingredients before you start. Place melted butter in a bowl and have a pastry brush for brushing it on the phyllo. Place nuts in a bowl near your work surface. Preheat oven to 350°F. Thoroughly butter your 9x9” pan using a pastry brush. Unwrap your roll of phyllo dough onto a cutting board and cut it in half, so it will fit in your pan. Cover the phyllo dough with a layer of plastic wrap and place a damp kitchen towel over the top. Butter another phyllo sheet and grab the one below it (so you have two sheets) and place them, butter side down, on top the pecans. Sprinkle with pecans. Repeat this about 4 more times, or until you are out of pecans. Butter another phyllo sheet and grab the one below it (so you have two sheets) and place them, butter side down, on top the last pecan layer. Repeat this two times, so you have 6 layers on top of your last pecan layer. Butter the top of the baklava. Bake about 30-40 minutes, until the baklava is golden brown. While the baklava is baking, heat the water, sugar, dark corn syrup, and vanilla in a saucepan. Bring to a boil, then reduce heat to lowest setting until the baklava comes out of the oven. 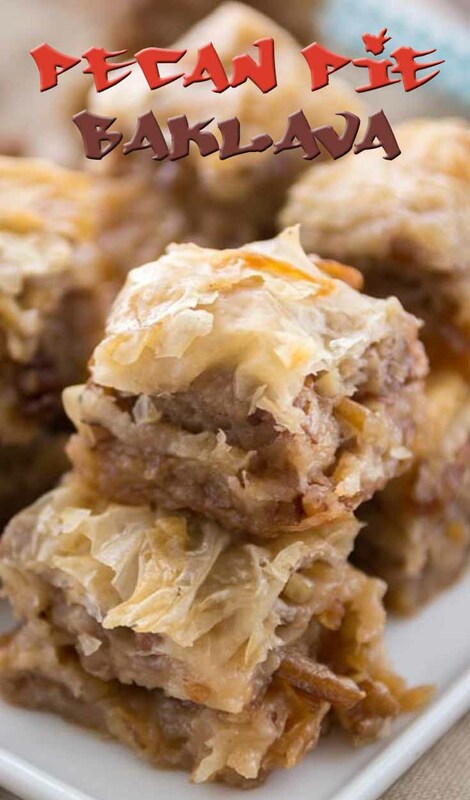 When the baklava comes out of the oven, pour the corn syrup mixture over the top, being sure to get it in all the cuts. Let cool completely, uncovered, for several hours.